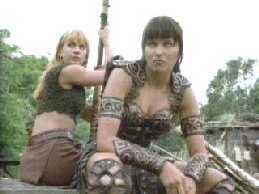 When Xena got bored waiting for Gareth in A DAY IN THE LIFE, she tossed her chakram around and watched it ricochet just for kicks. Boredom. One word says it all. You cannot escape it, or hide from it, and there is no medicine to cure it. Or is there? Why can boredom can be created but not destroyed? I believe I have found a way to destroy this nuisance. Xena . Again, one word says it all. I am sitting in zoology class. The clock is moving slower than my grandma on wheels, and everyone is supposedly reading "Everything you ever wanted (but never cared) to know about a sponge". Supposedly. Boredom strikes once more. If you can sit through a reading about sponges... seek help, fast. What do you do to cure this awful disease? No, do not shoot yourself -- you will ruin your grade point average. Take out your official Xena magazine and save yourself. Okay, okay, so you have read it a thousand times over, just make it a thousand and one. The point is: you are finally out of "Sponge-land". See, Xena can save you in real life...that is quite a feat for a fictional character. Family reunion. We all know the words well. Their meaning to teens: meeting people you haven't seen since you were four (or was that three? no, two ... maybe one? I probably was not even born yet) who give you the "My, how you have grown" cheek-squeeze torture. Yes, a total disaster. So, how do you escape those nagging relatives who are only interesting for about 20 seconds? Pull out your trusty Discman and blast your Xena soundtrack CD, #1 or #2, it is your choice entirely. (Though, I feel #2 left us hanging on that last song, but I am not going to get into that right now). Sure, your parents might yell at you to take your headphones off and join the family in once-a-year conversation, but then you just gesture at your ear like you have suddenly gone deaf and turn up the volume a bit more. Once more Xena saves the day (and your sanity)! You are taking a test in one of your few "nerd" classes, and a wad of paper knocks you up-side your head, followed by the annoying sound of snickering, trouble-making nerds. Before they know what hits them, you have put the neck pinch on the leader, and you're calmly sitting back in your seat again. If the teacher happens to ask why the kid is gasping for air, simply yawn and nonchalantly proclaim, "Oh, he must have a frog in his throat". (Leave your chakram in your book bag. It is not necessary this time). As Xena said about revenge, "It's true what they say, it's sweet". Oh, you're probably wondering if you should take the pinch off that guy... well, um... if you had to read this to find out, it's probably too late for him (Oooopps!). Don't you just hate it when that happens? Rollerblading down the street you take a quick glance back. If your eyes don't deceive you, the golf cart full of old men is still on your heels, and this time they are close enough for you to catch some of the colorful words they're dishing out at you. Hey, all you did was rollerblade on their tennis court. What is their problem? Well, at this rate, they will seize you when you stop to catch your breath. Looking to your left you realize that the next street is only a hop and a skip away, but the menacing, pearly white grin of a growling pit bull yanking on his unsteady chain makes you think before you leap. The dog is huge. What is this, a decedent of Graegus from UNCHAINED HEART (H13/113)? Swallowing the small lump of fear that has formed in your throat, you take a few steps back. The shouts of the old men's bellowing voices get closer. Gathering all of your courage, you speed toward the dog and do a Xena triple flip over the "terror with teeth", onto the road on the other side. While skating away, you yell Xena's war cry at the top of your lungs (and mine, I must say, needs a little work). The last thing you hear is the skid of a golfcart and the sound of teeth meeting machine. Ouch. Oh well, the old men have golf clubs, right? At least they should get out of there alive... possibly... maybe... oh well. There are many other life crises which Xena solves, but my hand is getting cramped from typing all of this, so deal with what I have named! In the words of many Xenites before me: "Battle On!"